Vector seamless doodle floral pattern. Childish ornament. Vector watercolor heart, splash background on wet paper. 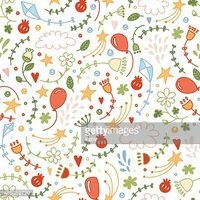 Funny doodle seamless pattern on pastel background.